Using data from the Viet Nam Population Health Programme Population Health Study, co-led by the SSRC’s Vietnam Program and the Vietnam Academy of Social Sciences (VASS) and sponsored by the Atlantic Philanthropies, “Choices of Commune Health Center for Acute Health Care Services” presents findings on choice of healthcare facility for patients suffering from acute illnesses in three provinces. The Study gathered data on healthcare facility utilization in two rounds (2009 and 2013). Findings suggest that while overall commune health center (CHC) utilization has declined in recent years, CHCs remain the first choice facility among several key populations: vulnerable groups, those with health insurance registered at CHCs, and those suffering from acute illnesses. 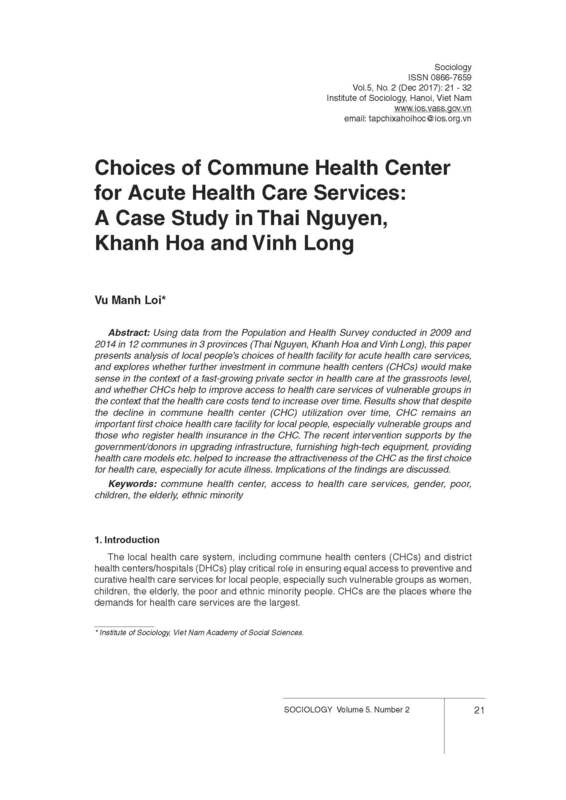 Vu, Manh Loi, "Choices of Commune Health Center for Acute Health Care Services: A Case Study in Thai Nguyen, Khanh Hoa, and Vinh Long," in 5, ed. (Hanoi, Vietnam: Vietnam Academy of Social Sciences, December 2017), 2, 21-32.